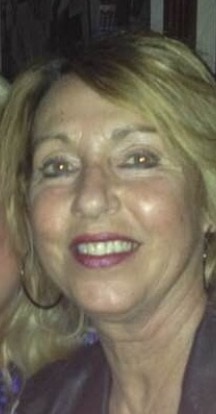 DeSisto, MaryJo, “M.J.,” 64, of Anoka Avenue, Barrington, died peacefully on April 3, 2019 surrounded by her loving family. A lifelong resident of Barrington, she was a daughter of Joseph G. DeSisto of Barrington and the late Mary E. (Berg) DeSisto. M.J. was a freelance makeup artist for many major cosmetic lines from New York to Boston. M.J. had a passion and spirit to dance and she enjoyed spending time with her family, friends and divas. She had the gift to spread love to everyone she met. Besides her father, she is survived by a daughter, Heather Lynn DeSisto Parris and her husband John Parris of Colorado Springs, CO; beloved sisters, Kim DeSisto of Barrington, Denise DeSisto of Barrington, Ann Travers of Swansea, MA and Kathleen Luther of Warren; three brothers, Tom “Del” DeSisto of Barrington, David DeSisto of Barrington and Jason DeSisto of Coventry; two granddogs, Murphy and Lucas; several nieces and nephews and several great nieces and nephews. She was the sister of the late Peter DeSisto. Her funeral will be held on Wednesday April 10, 2019 from the W. RAYMOND WATSON FUNERAL HOME, 350 Willett Avenue, Riverside at 8:45 a.m. with a Mass of Christian Burial in St. Luke Church, Washington Road, Barrington at 10 a.m. Burial will follow in Gate of Heaven Cemetery. Calling hours are Tuesday 4-8 p.m. Flowers are respectfully omitted. Contributions in M.J.’s memory to St. Jude Children’s Hospital, 501 St. Jude Place, Memphis, TN, 38105 would be deeply appreciated. I have fond memories of MaryJo going back as far as St.Luke’s! Her smile was infectious and I have pictures of her from those “May processions”, etc. because she and my brother, Bill, were in the same class. I would run into her on my trips back “home” to visit my parents and I just want you to know my thoughts are with ALL of you during this difficult time. My deepest condolences on the passing of your daughter, MaryJo. My sincere condolences I will miss MJ we always talked about our families & what was happening she was always positive . She has been my friend for more then 30 years. I know she is dancing up in heaven and God has received a new Angel! Enjoyed Mary Jo at OLF, and her smile brightened my days. She will do well in Heaven, and will dance there, too. She will be missed by all! To her Dad, sisters, brothers, daughter and all, my condolences. Having met her Mom and Peter, Mary Jo will join them in praying for all of you. God bless you all! Mary Jo always had a smile. I went to school with Mary Jo. Will miss seeing her at class reunions. My love and prayers to heather who MJ talked about all the time with such love. To Dad , much love to you . To MJ’s loving sisters and brother , I wish I could be there to tell you in person . MJ was always great fun for her loving family.I know MJ is fine because she believed whole heartedly in God and Jesus her Lord and savior .I am in Florida but my heart is with you all and with MJ. Please accept my sincere condolences. Heaven has a new angel now. So very sorry for your loss. went to school with Mary Jo, remember her as a very warm sweet lady, inside and out. God Bless you at this time of grief.